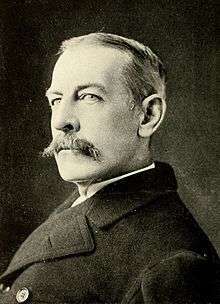 James Gordon Bennett Jr. (May 10, 1841 – May 14, 1918) was publisher of the New York Herald, founded by his father, James Gordon Bennett Sr., who emigrated from Scotland. He was generally known as Gordon Bennett to distinguish him from his father. Among his many sports-related accomplishments he organized both the first polo match and the first tennis match in the United States, and he personally won the first trans-oceanic yacht race. 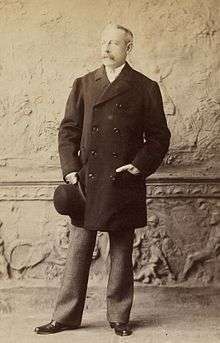 He sponsored explorers including Henry Morton Stanley's trip to Africa to find David Livingstone, and the ill-fated USS Jeannette attempt on the North Pole. Bennett was born on May 10, 1841 in New York City to James Gordon Bennett Sr. (1795–1872), the founder, editor and publisher of the New York Herald. He was educated primarily in France. In 1866, the elder Bennett turned control of the Herald over to him. Bennett raised the paper's profile on the world stage when he provided the financial backing for the 1869 expedition by Henry Morton Stanley into Africa to find David Livingstone in exchange for the Herald having the exclusive account of Stanley's progress. Bennett returned to the United States and organized the first polo match in the United States at Dickel's Riding Academy at 39th Street and Fifth Avenue in New York City. He would help found the Westchester Polo Club in 1876, the first polo club in America. He established the Gordon Bennett Cup for international yachting and the Gordon Bennett Cup for automobile races. In 1906, he funded the Gordon Bennett Cup in ballooning (Coupe Aéronautique Gordon Bennett), which continues to this day. In 1909, Bennett offered a trophy for the fastest speed on a closed circuit for airplanes. The 1909 race in Rheims, France was won by Glenn Curtiss for two circuits of a 10 km rectangular course at an average speed of 46.5 miles per hour (74.8 km/h). From 1896 to 1914, the champion of Paris, USFSA football (soccer), received a trophy offered by Gordon Bennett. He did not marry until he was 73. His wife was Maud Potter, widow of George de Reuter, son of Julius Paul Reuter, founder of Reuters news agency. He died on May 14, 1918 in Beaulieu-sur-Mer, Alpes-Maritimes, France. Bennett is buried at the Cimetière de Passy. Asteroid 305 Gordonia is named after him. He also has a street named for him near Chopin Airport in Warsaw, Poland. The Avenue Gordon Bennett in Paris, with Stade de Roland Garros site of the French Open, is named after his father. ↑ Department of the Navy, Navy Historical Center, "James Gordon Bennett Jr. (1841-1918)"